Departure in the morning direction Nogvorod. We'll miss Igor for the rest of our trip, he was fun company and quite informative. But then again who knows, maybe he was a KGB operative, haha, no I don't think so but it is not inconceivable. So few tourists these days, and three kids from NATO countries in a yellow Volkswagen? Very suspicious! It's a long ride and the road is of mediocre quality at best. About 50km out of Moscow, there is some road work on the highway. Again, as we have seen before just after we entered the USSR, most, in fact, all workers are women. The workers who work that is. There is plenty of men road workers who just lie down by the roadside and look on. 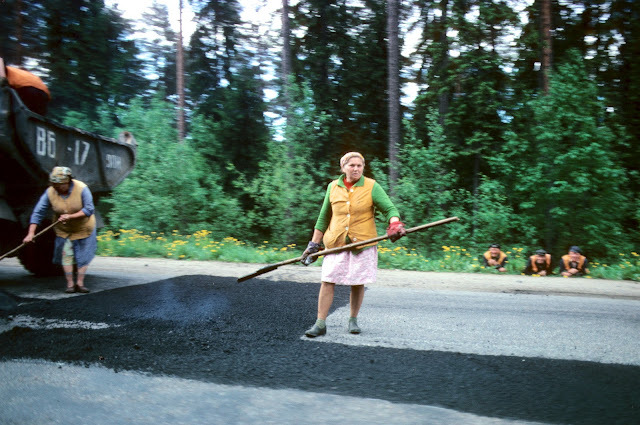 Soviet female road workers and male onlookers. Anyway, after witnessing some of the work of the unsmiling stocky Soviet ladies, we can see all vehicles ahead of us are re-routed to a secondary, much smaller, road. When we approach the deviation the man who is sending everyone for the detour flags us to go straight through and stay on the main highway. Such a privilege! Why? I imagine they don't want to show foreign capitalists poorly paved secondary roads that would make the country look bad. Not sure. We then keep driving splendidly alone on this newly surfaced black highway. Almost alone that is, because at some point we are passed by a very official-looking convoy of black cars, led by two big Mercedes Benz sedans (the first we have seen in the USSR) with police markings. Usually the police have Ladas, this must be an important convoy but they are too fast for us to try and peek inside and maybe try to recognize a Politburo member or two. The only problem is that the tar is so fresh much of it gets thrown up by Giallina's tires and ends up sticking to her pristine yellow sides. It will take a lot of work to clean it up when we get around to it. When we reach Novgorod we settle down in our assigned camping ground then head to town. Lots of small churches, I counted at least twenty, all next to each other in the same part of town. And they are ALL shut down "NA REMONT", for restoration. It's one of the first Russian words I've learned and I've read it so many times I am sure I'll never forget it. Can't get into any of them. Oh well.